A dish made with sharply spicy pickled mustard greens, whose flavor serves to stimulate the appetite. The rice used in this pilaf is 100% domestically produced, and the mustard greens were pickled using table salt and turmeric from Kyushu. Simply sauté or microwave and enjoy. Each package is 450g and arrives frozen. A dish made with mustard greens, whose sharply spicy flavor serves to stimulate the appetite. The rice used in this pilaf is 100% domestically produced, and the mustard greens were pickled using table salt and turmeric from Kyushu. 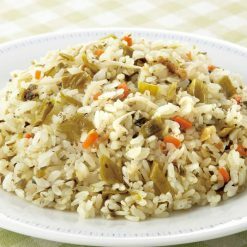 Along with mustard greens, this pilaf also contains whitebait, pork, carrots, and roasted sesame. If sautéed, the pilaf will become fragrant and still more delicious! Instructions for preparing 1/2 bag (1 serving): To cook in a frying pan, add a little oil to a heated frying pan and then add the pilaf with mustard greens (still frozen). Sauté for 3 to 4 minutes on medium heat while stirring with a wooden spatula. To cook in a microwave, distribute the pilaf with mustard greens (still frozen) evenly on a plate, then cover with plastic wrap and microwave approximately as follows. In a 500W microwave, cook for 4 minutes 30 seconds. In a 600W microwave, cook for 4 minutes. If the pilaf is not fully warmed after microwaving, continue to microwave in 10 second increments until fully warm. Cooking times will vary depending on the model of microwave and on the amount of food being cooked. Please microwave with care. After microwaving, the pilaf, plate, and plastic wrap will be very hot. When removing the plastic wrap and when handling the pilaf, please use caution to avoid burns. 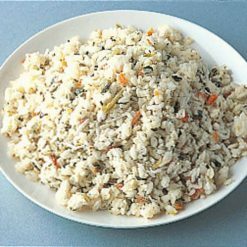 This product contains rice (domestic), pickled mustard greens [mustard greens (domestic), table salt], barley, carrots, vegetable fats and oils (rapeseed oil, sesame oil, soybean oil), pork, cooking wine (rice, wheat), whitebait, sweeteners (sugar, lactose), flavoring extract (kombu seaweed, yeast, chicken, bonito), table salt, rice vinegar, soy sauce, sesame, fish sauce, lard, spices, turmeric color, spices extract.. This product is not suitable for anyone with allergies to milk, wheat, soy, chicken, pork or sesame. Origin of ingredients: rice, mustard greens (domestic). Prepared and packaged in Japan.